Gloria Dei is on the corner of Market and Dubuque streets in Iowa City. Our main lot is just to the west of the building off Market Street. Two spaces near the front door and two in back at the east end of the alley are designated for handicapped parking at all times. Wheelchair ramp in the southeast back door. Elevator available for access to main floor. Follow the signs. For the 12:10 services on Maundy Thursday and Good Friday, our main Gloria Dei lot (between the church and LCM) will be available for those attending. 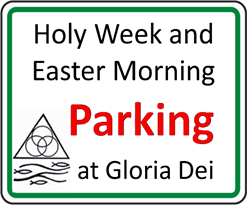 For the 7:00 p.m. services on Maundy Thursday and Good Friday, besides parking in the main Gloria Dei lot, cars with Gloria Dei permits* may also park for free in the Pappajohn Ramp on Clinton Street. For the Easter Egg Hunt and Easter Vigil on Saturday, the main Gloria Dei lot will be available for those attending. For Easter Sunday, free parking is available in the lot across Market street, both sides of Market itself until 1:00 pm, and on Clinton Street. Cars with Gloria Dei permits* may park for free in the Pappajohn Ramp.